Searchisweb.com is a browser hijacker that can sneak into your data machine and change the settings of all your web surfers. 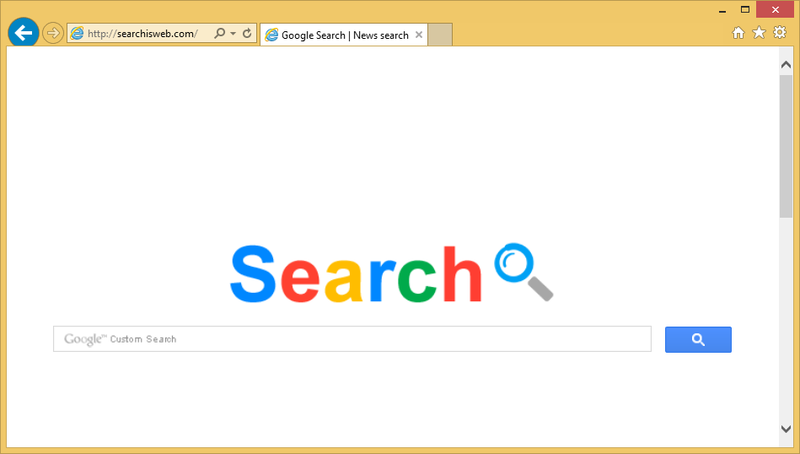 Your Google Chrome, Mozilla Firefox, and Microsoft Internet Explorer will have a new homepage and search provider. Once Searchisweb.com is ruling your computer’s system, you will not be able to choose the preferred settings. Therefore, you should delete Searchisweb.com infection as soon as possible. You can find more information on how to remove Searchisweb.com successfully at the very end of this article. Please make sure that you follow the guide attentively. Searchisweb.com is a sneaky hijacker and will definitely try to find a way back to your computer. The suspicious application will use every possible opportunity to stay in your system. How did Searchisweb.com reach your data machine? Searchisweb.com has an official internet page. However, you could not have installed the infection from there. Most probably Searchisweb.com has sneaked into your virtual device with the help of other questionable applications. Browser hijacker tend to enter the users’ computers via software bundles. This method is extremely common among the browser hijackers’ developers because the majority of computer users do not pay much attention to the installation wizard. For this very reason many undesirable applications hide in the installation setup. In order to deselect the unwanted programs, you should always choose the “Advanced” or “Custom” settings. By selecting the “Recommended” option, you may not be able to deselect the suspicious applications. Also, if the browser hijacker has already reached your computer, you should take care of the immediate Searchisweb.com removal. Why do I need to delete Searchisweb.com immediately? You will not find any information about Searchisweb.com browser hijackers privacy policies. Searchisweb.com simply does not reveal what kind of information the application collects. In the majority of cases, browser hijackers gather data about your web surfing habits, for instance, the IP address, visited internet pages, and commonly entered search queries. However, we cannot reassure that Searchisweb.com is not able to reach some of your even more private details. The only way to know that your information is safe is to delete Searchisweb.com once and for all. The hijacker is useless anyways; more than that, Searchisweb.com could cause serious computer issues. You may soon realize that your data machine has slowed down. This could happen of the enormous amount of ads being advertised in your computer’s system. How to remove Searchisweb.com from my computer? You can uninstall Searchisweb.com either manually or automatically. The manual removal will require you to find all the suspicious programs that may be connect to Searchisweb.com and delete them. In order to delete Searchisweb.com automatically, you will only have to implement a reputable malware removal tool. The security program will be able to erase all the threats instantaneously. On top of that, you will never have to face similar issues again because the antivirus program will protect your computer’s system from the annoying threats. WiperSoft.com is not sponsored, affiliated, linked to or owned by malware developers or distributors that are referred to in this article. The article does NOT endorse or promote malicious programs. The intention behind it is to present useful information that will help users to detect and eliminate malware from their computer by using WiperSoft and/or the manual removal guide. The article should only be used for educational purposes. If you follow the instructions provided in the article, you agree to be bound by this disclaimer. We do not guarantee that the article will aid you in completely removing the malware from your PC. Malicious programs are constantly developing, which is why it is not always easy or possible to clean the computer by using only the manual removal guide. WiperSoft is the best solution to Your PC problems! With this tool, you will be able to clean your system with minimal efforts. Do not hesitate to install Wipersoft and make you computer safe and fast! WiperSoft is a highly efficient PC threat removal tool. It can identify and eliminate spyware and adware present in your system including unnecessary toolbars, browser extensions, and other potentially unwanted programs. © Copyright 2019 by WiperSoft. All Rights Reserved.